Cupcakes made with coconut essence and dessicated coconut served with a white chocolate ganache topping. A surprisingly light and fragrant cupcake with a chocolate frosting. 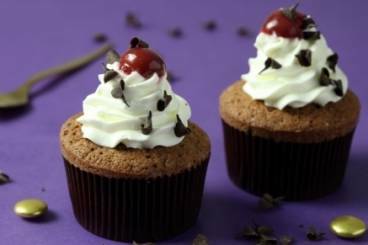 Mini black forest cakes made with cherries, cream and flakes of dark chocolate. A smooth and creamy chocolate dessert topped with a sprinkling of chopped pistachios and served with homemade shortbread biscuits.